NOTE: I am currently updating this project. Information may change often! There are hundreds, if not thousands, of coding examples in Python and for the Arduino for this exact project. I do not know Python, and I do not have an Arduino, thus I wanted to port this project to a language and platform I was familiar with. This project is designed to be a web-addressable RGB lighting experiment in NodeJS on a RaspberryPi. 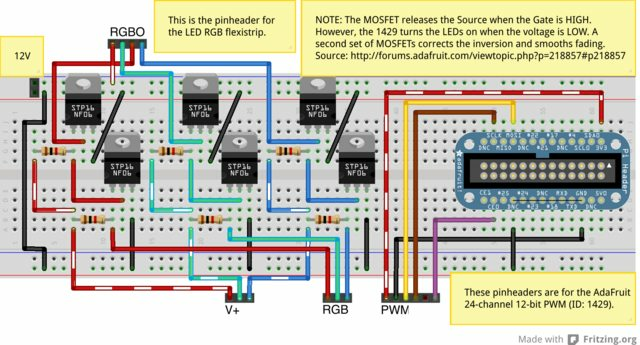 The goal is to create a basic webpage (served by NodeJS) to control the RGB LED strip. In addition to the front-end, I want to provide a REST API to both set and get the parameters. The following is a parts list that I purchased from adafruit.com. Additionally, from Radio Shack or other electronics supply store. Notably missing, is a case, a 5V Micro USB power supply and a 4GB SD card for the Raspberry Pi. I found the Solderless Analog RGB LED Strip Clip Sampler [ID:1004] AWFUL! They are aggravating and annoying to line up all four wires at the same time. Buy yourself meters of four-wire RGB+ cable from Amazon and use solder and heat-shrink tubing. The Breadboarding wire bundle [ID:153] was less than fantastic, the pins were too thin. Since your final project will sit on the Perma-Proto board, just buy Female/Female jumper wires and pinheaders. Found the jumpers cheaper on Amazon. The LEDs are nice, but you can get 5 METERS for the same price from a no-name brand on Amazon. I bought 3 strips, and each of them worked just fine, and just as bright. The circuit generally follows this tutorial. Hook up the RPi to the 24-channel PWM breakout board. Connect the 3.3V output from the RPi to V+ on the 24-channel PWM breakout board. I used the N-channel MOSFETs - three of them, one for each channel. We will use the PWM outputs to connect to the MOSFETs Gates. Connect up the PWM output 0 to the MOSFET with the red wire from the LED strip. Output 2 goes to blue. Connect the channel V+ line to the MOSFET Gates through the 1k resistor. What do you mean we are not started yet?? Relax, this project has a lot of moving (figuratively) parts to it. Go order your parts, then finish reading the rest of the tutorial. By the time you are finished, your parts should have arrived. Adafruit recommends their own easy-to-use distro Occidentalis. I have no experience with it. I will stick with Raspbian, but does require additional configuration. For this project, I used 2013-07-26-wheezy-raspbian. Once you complete the setup and upgrade of your image, remove (or comment out, with a #) the following line in /etc/modprobe.d/raspi-blacklist.conf. Second, add the following lines to /etc/modules and reboot. Unfortunately, there is no way to tell if the SPI device is connected and working. Download and extract the latest version of node. Create and copy the binaries to their new home, give the current user ownership of the directory. Set up login scripts. Copy the following into /etc/bashrc (/etc/bashrc gets run on non-interactive shells, allowing you to run ssh commands, e.g. ssh pi@rpi -c node index.js). This setup allows you to quickly and efficiently upgrade node as desired and easily install a package globally (npm install -g package) without requiring sudo. The top layer is just my own doing, but stands upon the shoulders of node-leddriver. The above version of the circuit has two issues, one of which was noted in the diagram. The other was found through testing. The MOSFETs releases the Source when the Gate is HIGH. 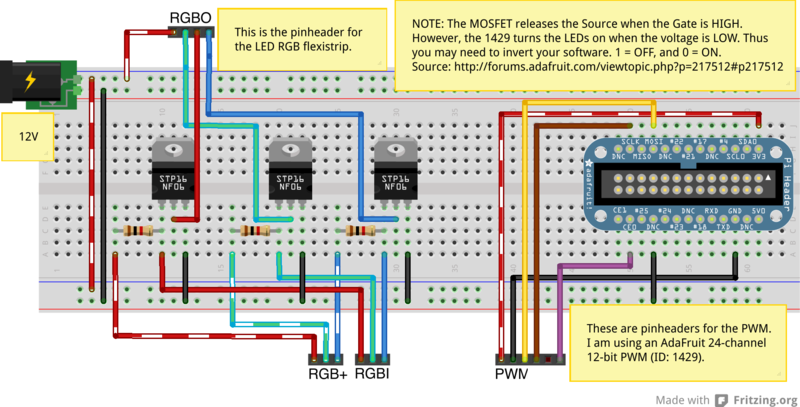 However, the 1429 believes the LEDs are on when the voltage is LOW. The PWM clears its internal buffers before sending the new data, therefore, fading between two colors yields a momentary spike to white (while inverted, or black normally), before the new color is set. To solve both of these issues, a second layer of MOSFETs is added to flip the inversion. Additionally, it has the added benefit of smoothing the fading by delaying the impact of the cleared data as it passes through the first set of MOSFETs.